An aerator is a machine used to aerate the soil in large lawns and turfs. A lawn aerator is available in two types, namely, spike and core. While the spike aerator makes use of wedge-shaped spikes to dig holes in the earth, core aerators are fitted with hollow tines that pluck out plugs from the soil. Better soil drainage: The main benefit of aerating the lawn is that it improves soil drainage, which in turn, is very helpful for the growth of new grass. Gets rid of lawn thatch: Using a lawn aerator to aerate the soil will contain the growth of thatch. Thatch prevents oxygen from reaching the grass roots. Aids growth of worms, fauna: Soil aeration helps the growth of worms, herbs and shrubs in the soil by providing them with the much-required oxygen. Helps new lawns: Aerating the soil before planting a new lawn is proven to be beneficial for the growth of the lawn. Water the lawn a day before: Before beginning soil aeration, water the lawn the night before as it makes the aerating process much easier. Flag items in the lawn: Flag important items like sprinkler heads in the lawn so that they are not damaged during aeration. Check weather conditions: Check if the weather conditions are suitable for aerating. It is not good to aerate during periods of drought or high temperatures. Run the aerator over the lawn: After flagging items, move the aerator over the lawn to cover all areas. Pay more attention to spaces like driveways and sidewalks where the weed growth is high and water access low. Apply fertilizer: Immediately after aerating, apply fertilizer on the soil so as to secure maximum possible benefit in the shortest time possible. Instant fertilizing after aerating helps the fertilizer reach the grass roots quickly. 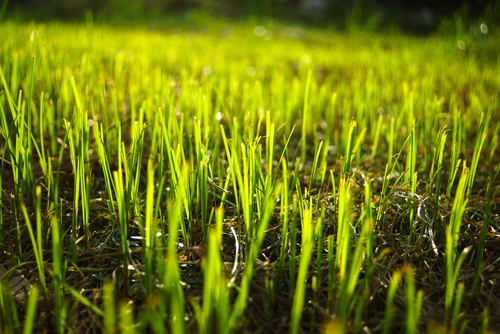 Use pre-emergent: After aerating the lawn, apply pre-emergent on the soil to prevent the growth of weeds. Water the soil: The last step in the aeration process is to water the soil, which helps break down the core of grass and soil in the lawn, and aids the growth of new roots. Lawns that have soil with high clay composition and are subject to frequent thatching should be aerated at least twice a year. For lawns with sandy or loamy soils, a single aeration is enough to remove thatch and facilitate grass growth. Still have questions? Talk to an expert at Runyon Equipment Rental to provide advice on your project.